Hello Window Insiders, and greetings from the Microsoft Edge team! I am Rajkumar Mohanram, Engineering Manager for Microsoft Edge and with me here is David Rubino, Senior Software Engineer for Microsoft Edge -- who is one of the key individuals responsible for mining and driving actions on the customer feedback we receive about our new browser. We want to take this opportunity to explain the importance of your feedback and telemetry, and give you some insight into what we on the engineering team do to turn your suggestions, opinions and problem reports into action and improvements in Microsoft Edge. Our hope is that this will spur you to keep the feedback coming, and that you’ll encourage your friends and colleagues to do the same. What you tell us really does impact the product, and here’s how. Before we continue, you should know that we are engineers on the Microsoft Edge engineering team responsible for measuring and increasing customer satisfaction along with overall product quality. Many of us have worked on previous versions of Windows and Internet Explorer for years. We are the people who are reading and analyzing your feedback on the core Engineering team. There’s no separate team analyzing, mining, filtering and summarizing for us. This is a big part of our job. We have several listening channels to understand Microsoft Edge usage, fundamentals, and quality in the real world. We rely significantly on user feedback – issues or suggestions/ideas – reported via the Windows Feedback App built into Windows 10, System Initiated User Feedback (SIUF) responses, the Microsoft Community forums on the web, Customer/Enterprise product support channels, and even social media channels like @MicrosoftEdge on Twitter. Feedback we receive comes from 3 pools of users– 1) Microsoft internal users, 2) Windows Insiders, and 3) Windows 10 users at large. Feedback from Microsoft internal users is used to assess the daily build quality and decide which build to flight to Windows Insiders, while the feedback from Windows Insiders plays a crucial role in shaping the overall Microsoft Edge feature set and quality for our public releases to general users. While this post is focused on customer feedback, we also have several listening channels for web developers including @MSEdgeDev. While David’s job here includes analyzing feedback from a number of different channels, the one that has the most direct impact and gets the greatest amount of attention is the Windows Feedback app, and that’s what we’ll talk about next. In Windows 10 Version 1511 we added a link directly to the Windows Feedback Tool from Microsoft Edge in the Feedback & Reporting pane. 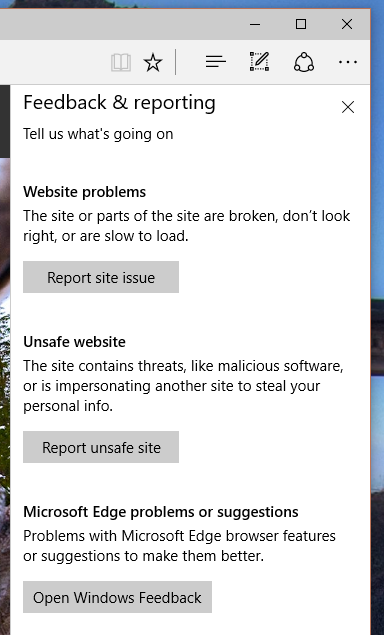 If you see an issue with a website or encounter a page that seems unsafe, you should continue to use the other options here, but if you have feedback on the Microsoft Edge web browser itself, click “Open Windows Feedback” and the Windows Feedback app will launch and start you out right in the “Microsoft Edge and IE” category. From here, you should start out by searching for existing feedback. Since we didn’t hire an army of people to look at hundreds of thousands of individual reports, we use vote counts to prioritize which feedback to look at first. So if the thing you want to say has already been said by others, you should search and then click “+ Upvote” rather than logging something new. Of course someone has to be the first, so if you search and find nothing, click “Add new feedback” and write something that’s clear, concise, and persuasive. So what do we do with all that feedback anyway? When a new Windows Insider Preview build rolls out to the “Fast” ring, we look at feedback 1 day later and 3 days later and report to the whole team about what we see. We’re looking to rapidly understand if there’s a big new problem that we didn’t know about, or if a known issue is proving to be a bigger problem for users than we thought it would be. So if you spot an issue in a newly released Windows Insider build, it’s very useful to us if you report it. Don’t assume we already know about it . . . some Windows Insider builds come out only a few days after we get a chance to try them ourselves! We read through as much of your feedback as we can, starting with the highest vote getters or with issues that have been surfaced by automated machine learning and text analysis tools . You can see some of these yourself by opening the Microsoft Edge and IE category in the Windows Feedback App. For each of these, we either link it to an existing item in our tracking database or we file a new item. By the way, this is the very same database we use to track our bugs and our work plans . . . and every time you vote on an issue your vote quickly shows up in the tracking database. We use vote counts to help us prioritize the most important and popular feedback, and we maintain a list of the top overall feedback that we review and track progress on continuously. 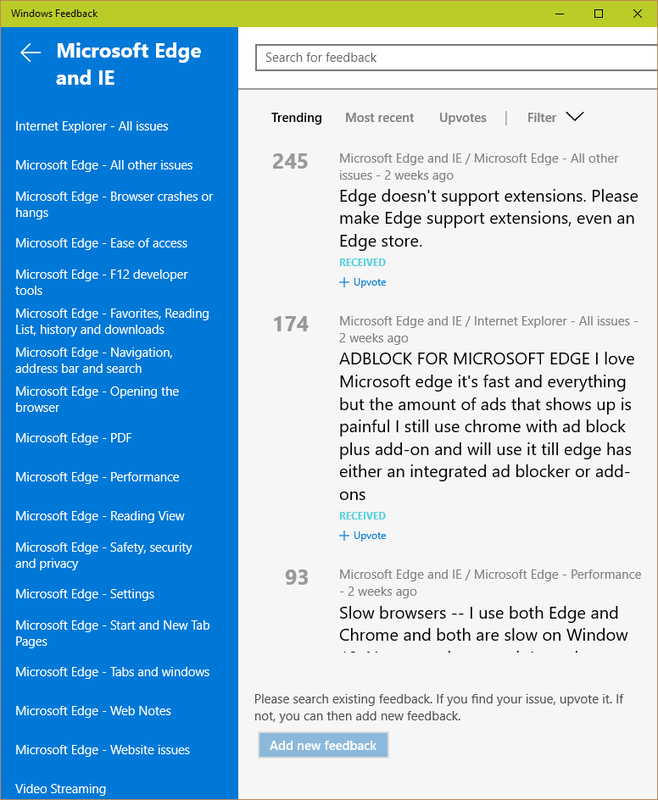 The top feedback list is a central part of how we plan “what’s next” for Microsoft Edge. Everyone on the engineering team knows what’s on the list and we’re all working to address it in future releases. The setting to change the search provider is more discoverable. Some of the top feedback we’re actively working to address includes requests for improvements to the download experience (including the ability choose where to save a download), an improved favorites management interface, an extensions model that will support ad blocking and translation, swipe gesture navigation for both phone and PC, “paste and go” for the address bar, easier tab closing on the phone, and much more. OK, so you read it and track it, but how does feedback make a difference? Both our initial Windows 10 release in late July and our Windows 10 Version 1511 release in November were significantly influenced by feedback. Often your feature requests were already in our roadmap and helped us clarify our priorities, but there are also some examples where feedback directly caused us to change our plans. The initial design for Microsoft Edge intentionally omitted the “home” button that had been present in Internet Explorer for 20 years. We knew some people still used the home button but didn't think it was essential for a modern browser. 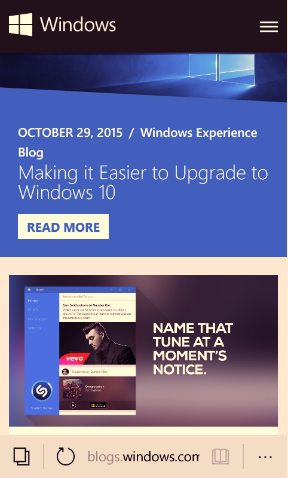 But as soon as we released the first Windows Insider Preview of Microsoft Edge, the feedback came in like a flood. There was almost nothing that you wanted more than the return of the home button. By the time we released to the general public, the home button was back. When we designed the new user interface for Microsoft Edge on the phone, we decided to go with a look that was more consistent with the PC version and with other mobile browsers. The address bar was on the top of the screen and the toolbar was on the bottom. We thought users would find this more familiar and comfortable, and while that may still be true for some users, we heard the feedback loud and clear from our faithful fans who were previously users of Internet Explorer for Windows Phone. You liked the address bar on the bottom, and for many of you it was a key reason you preferred your Windows Phone over the competition. It was a fair bit of work, but we moved it back to the bottom as quickly as we could before public release. Just one of many smaller examples of the impact of feedback is the addition of an “open folder” button on the prompt that appears when a download is complete. We initially thought prompts like this were cluttered with too many choices, and so we made a lot of them cleaner in Microsoft Edge. However, this option in particular was missed by a lot of people, and started to show up often enough in the Windows Feedback app for us to take notice. 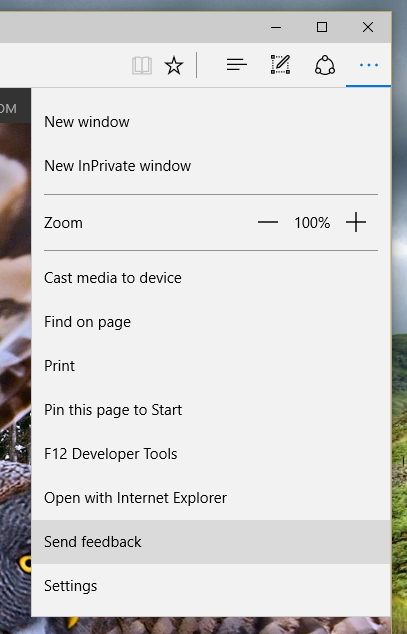 It was easy enough to do, so we added back the button a few Windows Insider preview builds ago, and it’s there for all of our users in the Windows 10 Version 1511. As we look toward upcoming releases of Microsoft Edge, your feedback has ever growing importance in planning and prioritization. In fact, it would not be an exaggeration to say that our product backlog (a.k.a. “to do” list) is more influenced by user feedback than anything else. The issues that are getting the most votes in core user scenarios are at the top of our list and we talk about them at every planning meeting. Your votes can bring new things to the top of the list. And even if your issue or suggestion doesn’t make it to the very top, know that it’s been tracked and prioritized. We are always looking to leverage your great new ideas and make smaller fixes and changes whenever we get a chance, and we also keep your opinions and sentiment in mind in all of our conversations about the future of Microsoft Edge. Thanks for helping us build Microsoft Edge, and keep that feedback coming!